It's no secret that we're huge proponents of niches at XYPN. Why? Because we've seen time and time again just how well they work. Specializing is a win for both the advisor AND the client. 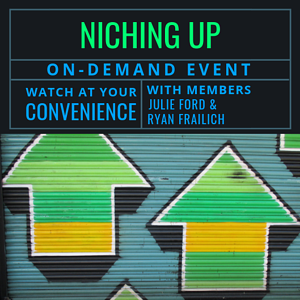 In this recorded webinar, two XYPN members, Ryan Frailich and Julie Ford, explore the ins and outs of serving a specific niche, from the advantages, to the challenges, to unique considerations. This recorded webinar is ideal for anyone considering XYPN membership. How big or small should a niche be? How do you choose a niche? How do you service your niche? What's unique about your offering? Will choosing a niche limit your ability to build your client base? After spending several years bringing financial freedom and literacy to underprivileged communities in the city, Julie Ford, CFP®, CPA, founded Ford Financial Solutions to connect more people with the financial-planning skills, counseling, and services they need. Julie's services help couples create order and reduce stress around finances and smartly manage their money so they can have a stronger and happier life together. Before becoming a fee-only financial planner, Ryan Frailich, CFP®, worked as a teacher and then as a school administrator overseeing HR, where he realized too many people feel overwhelmed with their finances, and too many people who want help are taken advantage of or shut out by our financial institutions. He changed careers and founded Deliberate Finances to change that.